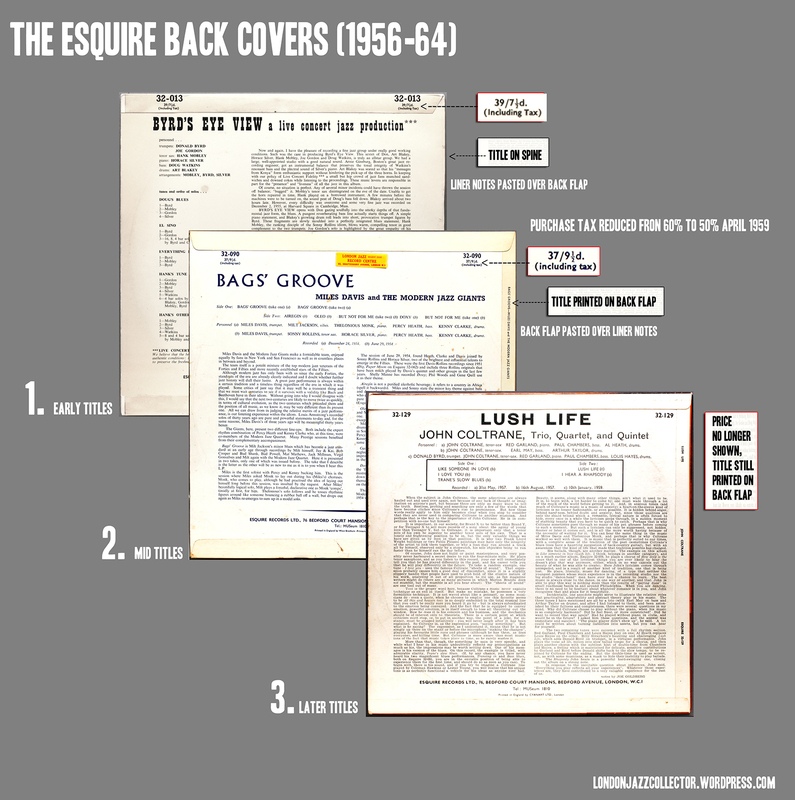 The back cover of each 32-000 series Esquire release has several key indications that place it in its relative chronology between 1956 and 1964, and may indicate its status as a first or second pressing, which is important to collectors.. The price printed on top left and right. This changed only once, from 39/71/2 d to 37/91/2 d around 32-080, (probably reflecting the drop in purchase tax in April 1959) and finally disappeared from the cover around 32-129 and never reappeared. These changes overlap for a few titles around the changeover point but a significant anomaly e.g. a popular early release (low catalogue number) which shows the later reduced price or no price, and has title printed on the back flap instead of the spine will be a second pressing. In addition to differentation by price and spine printing, European editions have the title printed on the back flap in a different direction to the UK edition text, and early Esquire covers have a laminated back finish whilst later are un-laminated matt paper. UPDATE January 27, 2013: merging information from two large separate Esquire collections (LJC and RF) provides a verified status for nearly half of all 12″ 32-000 series titles issued by Esquire between 1956-64, shown below. Some titles are known to have at least two editions (asterisked), others may exist that we don’t have an example of. For some reason number 103 is not listed here. It is the well known Roy Haynes ‘We Three’ album (with Phineas Newborn and Paul Chambers), 37/9 and FL. Hope useful. elaborite notes sent by e-mail. Did not know how to squeeze them into your list. Great work gentlemen. Looking forward to seeing your notes incorporated into the piece. Do either of you happen to have a couple of spare loose poly bag inners like the one pictured with 32-109. hapy to pay or trade you for some of the Decca Vogue sleeves I have in great shape. Sorry John I cannot help you. Did away with them when I bought the albums originally and replaced them by brown Kraft paper sleeves. I only got some in the last years when I bought the eodd missing Esquires. wow,what an amazing research, in such a short time. Thank for giving this fantastic review. I am not a methodical man, but I observe. To see it all neatly exposed, as you did, is something really exceptional. I will go through my collection of Esquires, and we will compare notes later on. And such speed! Thank you. I am unable to find the inner inner on my few very early Esquires, though one has a thin paper flip-over that looks like it might be the outer inner. I know I go on about the descriptive limitations of words, but a picture really gives you an instant aaha. Yes, that’s it, no, that’s not it. As they say, try using words to describe the classic glass “wasp-waisted” Coca Cola bottle.